As baby boomers continue to retire from the ranks of advanced manufacturing, educators, workforce development groups, and businesses have adopted new methodologies to prepare students and adults for certifications and career opportunities. In an effort to illustrate the career opportunities of local industries, the Bristol Chamber of Commerce hosts a variety of employer tours through its member partner program. 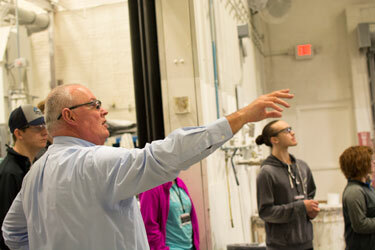 This year, the Chamber of Commerce focused its tours on the growing healthcare and manufacturing sectors. 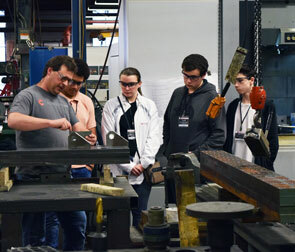 Strongwell was chosen as one of the manufacturing tour stops for both Virginia High School and Tennessee High School students. Upon their arrival, a presentation was provided highlighting the demographics of the community workforce, regional partnerships, career paths of employees, STEM outreach initiatives, community involvement, scholarship opportunities, educational diversity, and continuous learning. Students chose specified tours with seasoned professionals regarding the da ily operations of drafting, marketing, pricing, engineering, industrial maintenance, electrical engineering, information technology, accounting, business, CNC, welding, R&D, process engineering, prototyping, and 3D printing. After the completion of the tours, the President and CEO, of Strongwell, David Oakley, held a question and answer forum to address manufacturing concerns, generational outlook, and opportunities from students.